Responsive themes are important for visitors and for website creators. In a world where people have multiple devices and use them on a regular basis, being able to switch from device and get the same image display is of supreme importance. 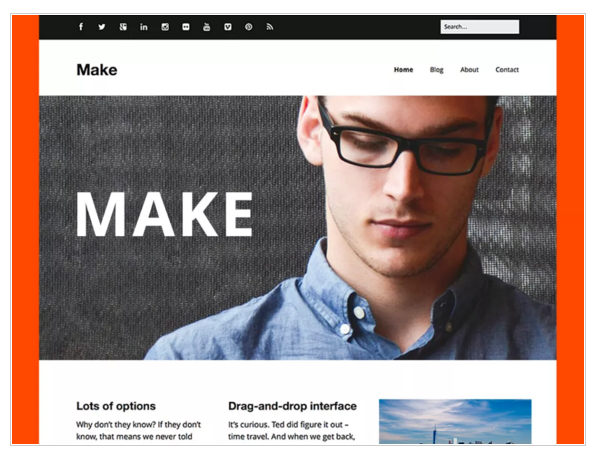 Here are 10 of the best free responsive WordPress themes. Zerif is a one page responsive WordPress theme built on Bootstrap with parallax support. The style is clean, modern, and minimalist. And while it’s not flashy it can be both good for the corporate and business world, as well as a good platform from personal and artistic use. The full screen image makes it one of the best. It is compatible with WooCommerce, WPML, RTL. It is also Retina-Ready and has SEO capabilities. 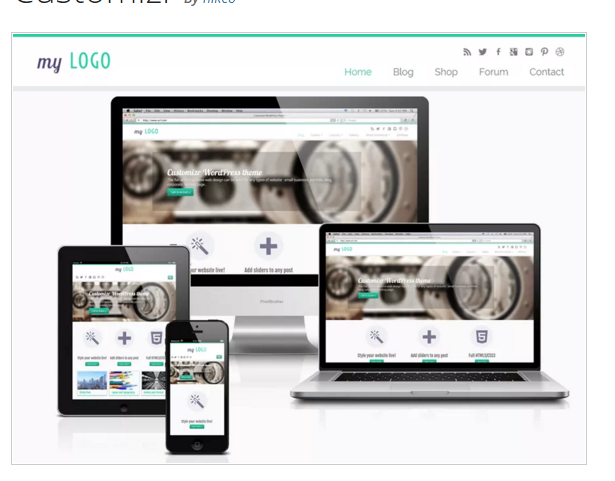 This theme is great for businesses and is geared specifically toward construction companies. However, its general corporate appeal makes it usable for other organizations as well. There is a pixel perfect responsive design, and it can also store large images. Also clean and modern there is a social menu (optional), and footer widgets and templates for blogs and businesses alike. It’s found common among translators, interior designers, architects, plumbers, lawyers, painters, roofing businesses, repair businesses, and consulting businesses. The customization options, however, is what makes it so versatile and popular. This responsive theme has a wide array of theme options on a panel making it easy to customize and personalize without getting too complicated and using code. It also comes as HD retina-ready and a full width slider. It’s easy to add logos and create a sheik-looking, while professional, homepage, with the built-in homepage layout feature. Customizr is a simple, but useful, responsive theme. It shows the design in live preview to give a true sense of the visitors perspective. It is compatible with all browser and is great for developers, as it offers a well documented and modular code, making it easy to extend with hooks. 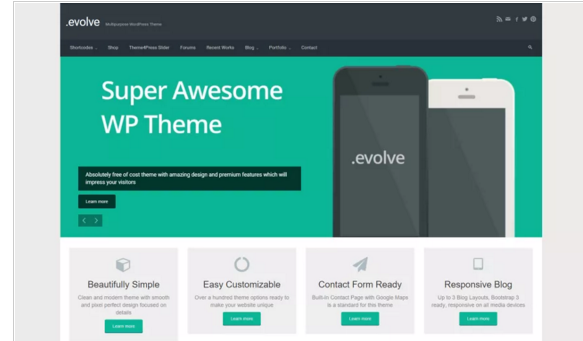 This theme has flexible customization features with a drag and drop page builder to make the initial design easy and stress-free. The theme is flexible and most types of pages will fit the templates – portfolios, photography sites, businesses sites, professional magazines, or even simple blogs. The beginning steps involve customizing the backgrounds, layouts, fonts, and colors for your site. Then you organize your content with the drag and drop features to make the site what you desire. It is compatible with other popular plugins like WooCommerce, Gravity Forms, Contact Form 7, Jetpack, and WP PageNavi. Enigma is both multipurpose and responsive. 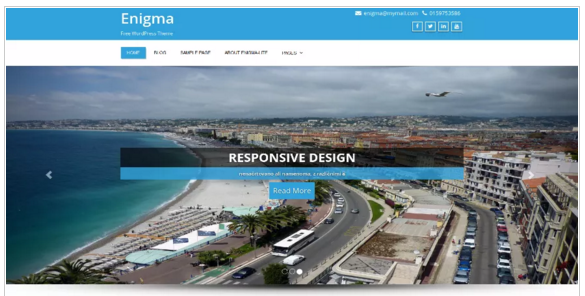 Great for businesses, portfolios, or personal use, Enigma is based on Bootstrap CSS framework, making it adaptable to all devices and providing good-quality optics. It works well on all leading web browsers and the theme is retina ready. It comes with 4 page layouts, 2 page templates, five widgets (with a 2-column design option available). The footer widget adjusts automatically to your other settings. It’s great for photography oriented sites as there is a Flikr custom widget to show your Flikr photos quickly and easily. You can also easily place your social media links onto the header to better your SEO. 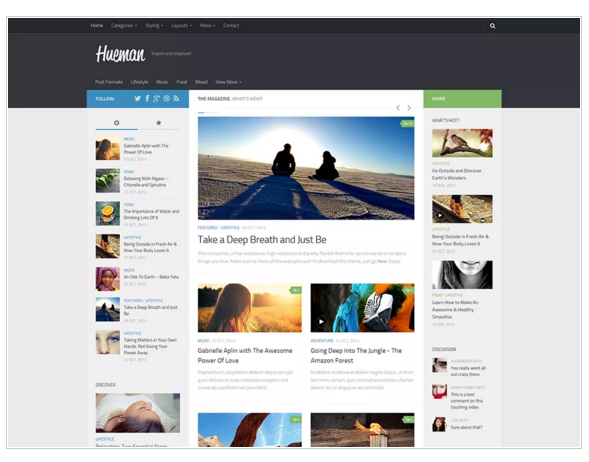 A popular option for blogs and magazines is Hueman. It’s 100% high-resolution theme and comes with toggle sidebars that give great browsing and reading experiences on any type of device. The theme also comes with a set unlimited topbars headers, footers and accent colors. There are also unlimited widget areas, and customizable sidebars on the left or right that can be set up to match every page or post to your liking. There is also a featured story slider, SEO functionality, and 3 flexible custom widgets you can make. We’re using this theme on this blog! This theme has been revamped and redesigned recently to become a responsive theme. It comes with Bootstrap and Parallax sliders with up to 5 slides for a page and 10 different posts for a given category. Additionally, you can customize the slider effects and animated effects. The theme also comes with button and arrow features with each sliders, to optimize customization, while also electing to have slides be automatically cycled through is an easier option. 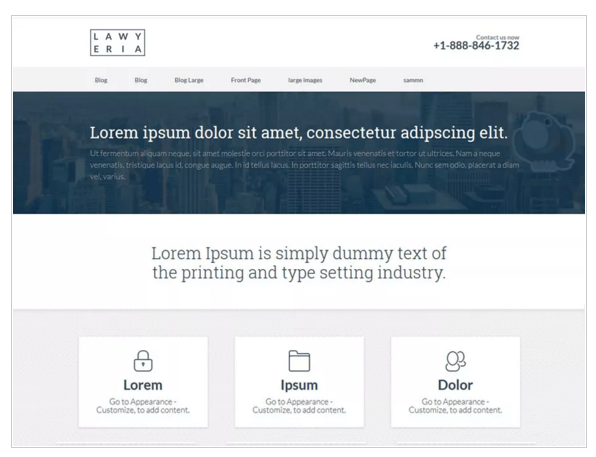 The bootstrap construction makes it user-friendly and easy to adapt all parts of the site. It comes with a FontAwesome icon pack with more than 500 Google web fonts. It also comes with 12 widget areas, four in the header, four in the footer, and two in the sidebar. You can also add your own custom widgets to increase personalization, change the setting to featured posts, archives, and other areas. 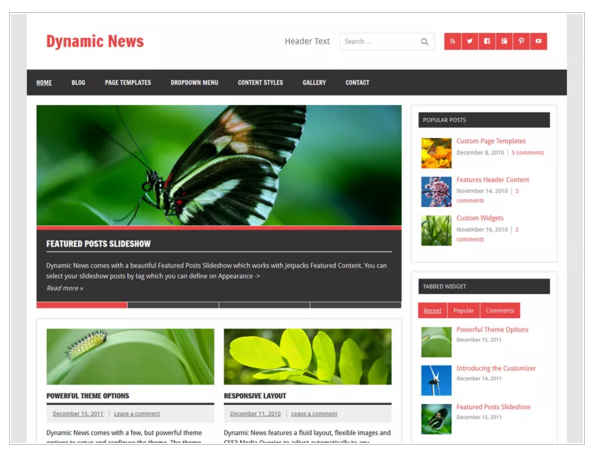 This is a multipurpose theme for blogs and magazines. There are a large number of colors and fonts to choose from. The theme also comes with a content slider and magazine page template. There are versions for both wordpress.com and wordpress.org. This is a more of a corporate-esque theme. 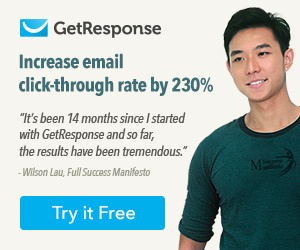 It has a clean, modern, and fresh looking design making it great for businesses. As the title indicates it’s specifically geared for attorney businesses and law firms, but can be used for other purposes as well. The responsive homepage contact form and the email/phone visibility make the site and contacts easy to manage both at the office or at a remote location. These are 10 of the best free responsive WordPress themes, handpicked for your by our WordPress expert. Go through each one of them and view the preview of each theme to be able to decide which theme to download. We highly recommend buying a premium WordPress theme instead of a FREE theme as they provide huge list of advance features and quality support if you get stuck anywhere.